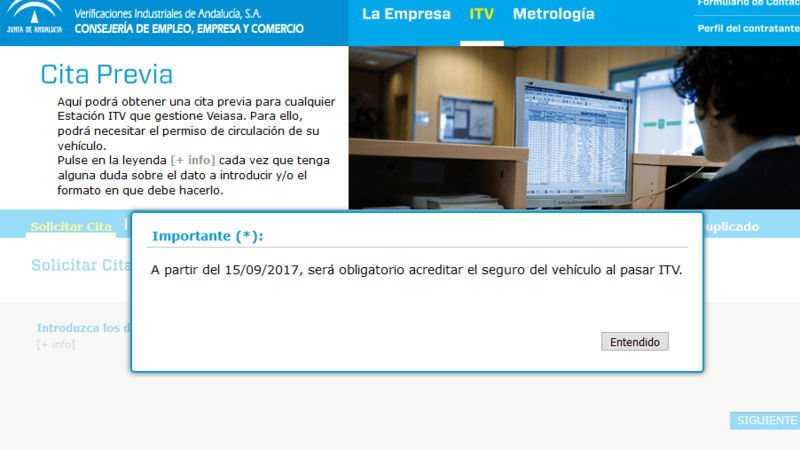 The Andalusian ITV network has announced that as from today it will be obligatory to show your vehicle is insured in order to pass your (MOT) inspection. This redundent piece of paper that they are demanding must show proof of payment, period of insurance, type of cover, vehicle ID and the insurance company. VEIASA, the public company that owns the ITV network, says it is obliged to ask for the paperwork under the 2015 traffic law, whose name I can’t be bothered to type out in full here. Now, it’s worth pointing out that you don’t need your proof of insurance paperwork for any other reason that this one, and for the last two years the insurance companies have been phasing out sending you this proof. Because nowadays it’s all on the computer, and the traffic police know in a second whether or not you have insurance. You are no longer legally obliged to carry proof of insurance (just the claims form). Dammit, the new traffic cameras they have even automatically check your insurance on the national database and issue you a fine if you aren’t signed up. So, just to save the ITV guys from typing your numberplate into a computer, we all have to take a giant step backwards and start carrying out redundent and useless pieces of paper. As well as, no doubt, people having to make a second trip to the ITV station to take along the piece of paper they forgot in the first place. This entry was posted in Blog and tagged car, dgt, insurance, itv, paperwork, progress, vehicle by David. Bookmark the permalink. I still don´t understand what “Reduncant piece of paper” means –the insurance document? Grateful for explanation! I mean you have to get your proof of insurance paperwork ONLY for passing the ITV.